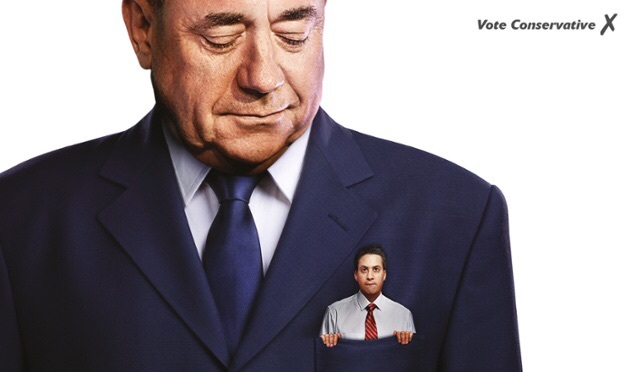 A few weeks ago, the Conservatives released a poster by their advertising agency containing a large Alex Salmond with Ed Miliband in his pocket. No words, apart from “vote conservative”. This was followed by yet another childish Prime Minister’s question time spat between David Cameron and Miliband over Cameron’s insistence that Miliband should “rule out” any deal with the SNP to get them into Downing Street. Cameron’s people had come up with a classic soundbite that that combination is “the party that wants to bankrupt Britain and the party that wants to break-up Britain”. We then had a little Tory ‘demonstration’ outside Saturday’s Labour Party rally, with the Conservatives wearing Salmond masks. Since then, journalists have tried to do The Conservatives’ bidding, by constantly badgering Miliband and Ed Balls about whether they will rule out a deal with the SNP, with both saying that, apart from their obvious aim being a majority so this is all irrelevant, they are not prepared to rule anything in or out at the moment. The reason for this is that it would not be in the country’s best interests to do so. Ruling out the possibility of a coalition between the only parties with enough seats to have a majority between them would be foolish. Much as I don’t believe the SNP has anybody’s interests at heart apart from the Scottish people, they have already indicated that a deal with them would involve them not voting for certain things (Trident) without forcing others in the government to do that too, so it is possible a working government could be created with them as part of it. If the only way we can have a majority is if the SNP join with Labour, and Labour know that not joining with the SNP means that a Conservative Government get back in, they are unlikely to just sit back and allow that to happen, and I’m not sure the electorate would forgive them for it. The Liberal Democrats, who are in the amusing position of relying completely on the election system they have dedicated their last century of their history to destroying to deliver them seats, are far more open with their beliefs on this. As they showed after the 2010 election, the Lib Dems understand that sometimes, of you are the only party that can help a government be formed, you have to do so in order for our government to operate. Ed Davey seemed to commit on the BBC this morning to the ‘largest party’ being the one with the most seats (which makes sense as it is the one most likely to be be in a position to for a government. So the Lib Dems are planning to be in some sort of coalition or confidence and supply deal, and are making a virtue of doing so (‘as they will cut less than the Conservatives, and spend less than Labour’). This, in their position, is probably sensible. Ruling anything out right now is not. Labour, scratching around for some sort of retort to what the Conservatives are saying, are asking whether the Conservatives will rule out a deal with UKIP after the election. There is, of course, a difference here, given UKIP will have at most 5 seats to play with whilst the SNP really will be kingmakers as the bookies are suggesting about 42 seats is likely for them. The Conservatives aren’t about to lose so many seats in Scotland so are genuinely less likely than Labour to need to be in coalition with anyone. They only need 23 seats, which, with an average majority for whoever has the 23 closest seats being about a 1000 means they need to pick up 11500 votes off whoever are the incumbents in those seats. Furthermore, UKIP are a national party, whilst the SNP are a Scottish party with no mandate from the rest of the UK. I was talking to Professor of Modern British History the other day. She was thoroughly unimpressed with this election campaign, but realised that the aftermath could be extremely interesting, and something that could be studied for a long while afterwards. The key right now for all the parties is not to rule anything out. I realise that the SNP and Conservatives have done so, but I also realise that part of the SNP brand is to hate Tories, so it is unlikely they can do anything else. That said, if the only way we can have a functioning government is through a tie up between the Conservatives and the SNP, I wonder what will actually happen.